Google's Chromebooks made the biggest splash this week at the company's developers conference Google I/O. Both Acer and Samsung will be the first notebook manufacturers to sell the laptops based on Google's own Chrome OS. Chromebook laptops are a radical departure from traditional laptops and instead of relying on local storage they will depend heavily on cloud services for document and media storage along with security and software updates. But what sets Acer's Chromebook from Samsung's? The Acer Chromebook is the smaller of the two Google Chrome OS laptops announced at Google I/O on Wednesday and is also cheaper than the Samsung Series 5 Chromebook. There are also a few other differences between the two Chromebooks, so here's help deciding which to pick if you're interested in these devices. 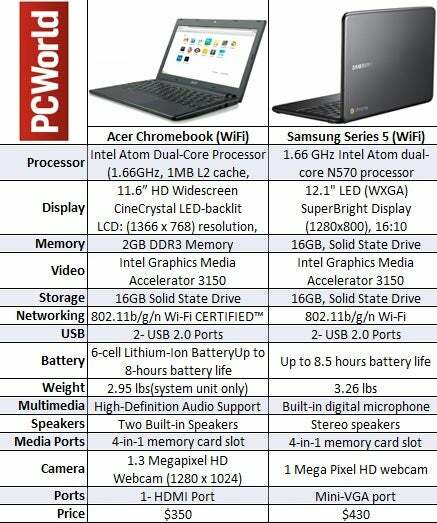 Click here to view a side-by-side comparison of specs for the two notebooks. First, here's what's similar about them: Both come with 2GB of RAM, 16GB SD, and the Intel Atom N520 dual-core processor (1.66GHz). Ports and other hardware features are also quite similar: two USB 2.0 ports, a 1 MP webcam, 4-in-1 card reader, and full-size Chrome keyboard and clickable trackpad. At $430, the Samsung Series 5 wi-fi model is $80 more than the Acer Chromebook. For that price difference, you get a slightly bigger 12.1-inch display (1280-pixel by 800-pixel) compared to the Chromebook's 11.6-inch widescreen display (1366-pixel x 768-pixel resolution), a mini-VGA port, and slightly longer battery life (8.5 hours versus the Acer Chromebook's 8 hours). Samsung also claims the display is 40 percent brighter than typical laptops. On the other hand, the Acer Chromebook is about a third of a pound lighter (2.95 pounds versus the Series 5's 3.26 pounds), has HD audio support and an HDMI port as well. Your choice may come down to price and whether you need an HDMI or VGA connection. Both laptops also promise a fast 10-second boot time, auto updates, and cloud connectivity. Interested? You can place your order for either laptop on June 15th. For more help deciding, here's a visual tour of both the Samsung Series 5 and Acer Chromebook and a Prospective Buyer's Guide to Chromebooks.